A ride leader’s job is to uphold our club’s reputation for delivering beautifully memorable scenic rides in an atmosphere that is collaborative, fun-filled, and safe at all times. Our dedicated group of 25 ride leaders is without a doubt the cornerstone of our club and we are justifiably very proud of the superb work and commitment they display on every ride. Understandably, our club puts a very significant emphasis on safety, as without it, all fun would immediately disappear. This is in line with our national CTC directives, which moreover specify that ride leaders have one additional responsibility that other club riders do not have, that is the “duty of care” towards their riders. Such duty of care basically requires that you ensure that no rider is left behind, that you render assistance in case of mechanical breakdown or injury, and that you lead your ride in a way that reduces your riders’ exposure to risks. To ease your job and guide you as a ride leader, the national CTC has promulgated very broad principles regarding group leading and cycling with a group. CTC further encourages its local clubs to develop their own detailed procedures, a sort of “hymn sheet” for ride leaders and riders alike. Anyone familiar with group riding will understand that such hymn sheet leads to predictability and consistency, two key components of group riding safety. 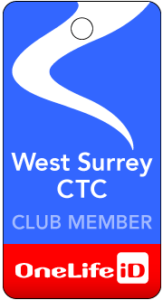 At CTC West Surrey, we refer to ours as “Guidelines” and they are essential reading for all club members. Our guidelines are based on best practices collated from decades of cycling experience. They call upon all riders to work as a team in a collaborative fashion, a key attitude needed to assist you as a ride leader in delivering a safe and fun ride. This is why we require that you canvass your riders at the end of a ride to get their feedback on how the whole group can improve their riding experience. It is also why we require that you as a ride leader work in close collaboration with your back marker – useful as we have not yet found ride leaders with eyes in the back of their heads! Our Rides Secretary occasionally issues supplementary guidance instructions to ride leaders. You will find below a short list of the documents you need to be familiar with as a ride leader. If you have any questions, please feel free to contact the Rides Secretary who will be delighted to assist you. Things to do to ensure you and your riders are covered by CTC liability insurance. Guest Entry Form to be completed by non CTC members participating in our rides (as an editable Word document, or as a PDF). An incident report form to be completed by if there is an accident during a ride (as an editable Word document, or as a PDF). National CTC’s Guide to Cycling with a Group leaflet . National CTC’s Guidelines for Leaders leaflet . National CTC’s fact sheet on insurance and ride organiser’s liability (2014 edition). members pre-registered on specific riding groups (see Information for Riders). ** Please contact the Webmaster to ensure you are pre-authorised to do this. Send an email to the website with the title of the announcement as the header and the body of the email as the announcement itself. Do not add a signature or any other text at the bottom of the email. Limit your email to a total of 30 words otherwise it will not all be visible on the front page. For the website email address please contact the Webmaster . ‘Google Groups ‘have been set up for each of the Ride Groups to enable members o easy send an email to a whole Ride Group at once. If you wish to do this please email the webmaster for details. You will find in this website many very useful tools for your ride planning, such as coffee and pub stops, route planning websites or GPX downloads of known scenic routes,. We seek to continually build our website database so don’t be shy to send us your latest find. Please contact our Webmaster. For a crime in progress, always use 999. After the fact: report anti-social driving by calling 101 anywhere in England, Wales, Scotland; available 24/7. If we provide the police with accurate information from multiple individuals, not in or on the same vehicle, the police can take action. This can range from a letter or a knock on the door to court appearance and prosecution with 9 penalty points without serious injury having to happen. For Surrey: use the the Online form at www.drivesmartsurrey.org.uk. Pot holes are more dangerious to cyclists than car and trucks. Surrey highways survey using video cameras, but we cyclists are best placed to identify and report. Help SurreyHighways help us. Report them using: https://www9.surreycc.gov.uk/highwayproblem/ or via the CUK phone app https://www.fillthathole.org.uk/. Reporting does work. You’ve had a great ride with your group? Please consider submitting a few words and pictures. Our Webmaster will be pleased to post this on the club blog for you and we all look forward to reading you. On behalf of all club members, thank you for so kindly contributing your time and expertise!